Six months back, the economic think tank from Pune Arthakranti Pratishthan submitted a very insightful policy blueprint on the steps to be taken to address the Indian economy. The proposal was submitted to the Prime Minister and the Finance Minister which received great appreciation. Narendra Modi had in fact called a person called Anil Bokil to discuss the proposal in detail. The Prime minister who was inspired by the overall plan extended the talk up to 2 hours. He was the same person who had given the proposal to ban the high denomination notes of 100, 500 and 1000 rupees. Narendra Modi who considered this proposal very seriously, on 8th November announced the demonetization of 500 and 1000 rupee notes. This became the most historic decision ever taken by any government. This not only brought thousands of crore cash illegally stacked in houses into circulation but also put a sudden break to all anti-social activities in the country. Ever since Modi announced the demonetization of old notes, Kashmir saw no violence, the stone pelting incidents declined drastically since 5 days and the naxals-Maoists activity in the country has fallen greatly. These issues are something which is destroying the country since decades, we almost thought there can be no solution to the problem. Although people knew that it was the political parties, separatists and cross-border terrorists who fund these activities, it was impossible to control this gang because of their high profiled network and insiders in government, media, and opposition who were protecting them in all aspects. But one move by the Prime Minister has shown how black money is directly responsible for all the problems of terrorism, corruption, price rise and inflation. Scrap all taxes, including INCOME TAX, except import duty. All heavy amount transactions MUST be made through DD, Cheque, and online banking system. A cap should be put for the maximum amount of transaction through cash. The government should introduce single point taxation system through banking system. These proposals made by the Arthakranti Pratishthanare aid to be groundbreaking. In fact, many economic experts also have suggested the scrapping of income-tax completely which will remove the burden of the hard working middle class and salaried person. According to few reports, the Prime Minister has taken the issue of scrapping the income tax seriously and is looking to chalk out the strategy to implement the new policy. Few internal inputs we received say that the financial year which usually starts from March-April will be shifted to Jan-Feb from the year 2017. So the government may scarp the income tax from the FY 2017-18 and replace all taxation system through BTT (Banking Transaction Tax) from 1st April 2017. This announcement will be probably made on 31st December. GST (Goods and Service Tax) as Indirect Tax. If implemented, this will be one of the groundbreaking economic reforms of the country. There is a huge advantage if the government scraps the income tax. Consider a salaried person, he pays the huge amount of his salary to the income tax, but if it is scarped the take-home salary of the person in increased which will inturn increase the spending capacity of the person. Hence there will be no question of tax evasion which will put an end to black money generation. All the commodities rates will be reduced drastically, especially petrol and diesel for which we may 50% of tax. The entrepreneurs, start-ups, and businessmen will invest more in the market which will provide more job opportunities to people. Since the buying capacity of the people also increases, the demand for products increase which again increases the production rate and manpower. The land, sand, mining mafia all work on black money market, so once the black money market is thrashed, the prices of lands, properties and houses will automatically fall and all section of people will be able to afford to buy. The banks would provide more loans with lesser interest which will make people invest in various aspects of business. The entire root of terrorists, Maoists, so called NGO’s are connected to the black money supply. They are heavily funded by various political parties and foreign organization to destabilize the country and Indian economy in the name of freedom of speech and Azadi! This will not only stop all illegal activities in the country but will boost the Indian economy. The rupee will regain its value in the global market which will reduce the exchange difference of Dollar Vs Rupee. This will change the economy of the country overall and put India back on track in the race to become the global power. Prime Minister Narendra Modi’s decision to demonetize Rs 500 and Rs 1000 banknotes may have been influenced by a Pune-based think tank called Arthakranti Sansthan. 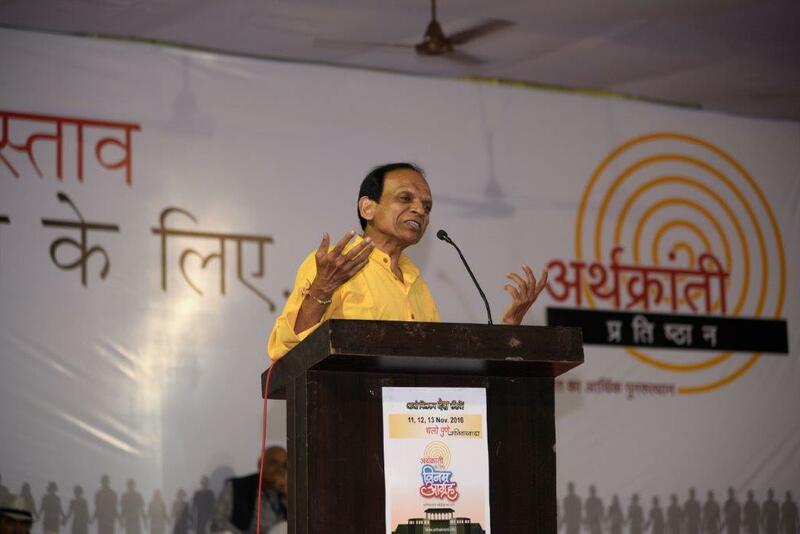 It was a theory first put forward by Anil Bokil and his group that advocates financial reforms in India. In 2015, Bokil had a two-hour meeting with Modi, say his colleagues. During the meeting, Modi showed his keen interest in understanding the proposal presented by Arthakranti Sansthan. “It was Arthakranti that influenced Modi’s latest announcement,” said Bokil. When pointed out that government has replaced Rs 500 and Rs 1000 denomination notes with higher denomination such as Rs 2000, Bokil said it was a temporary move to quickly replace the now invalid currency. “We believe it is just a stop gap arrangement,” said Yamaji Malkar, a Marathi journalist and Bokil’s colleague at Arthakranti. Bokil who is in his 60s, is a mechanical engineer turned financial theorist. Among the other points, Arthakranti has been insisting for withdrawal of all high denomination currency and replacing all taxes by single point 2% tax on all transactions that should be routed only through banks. While many say Arthakranti has affiliations to the BJP, the think tank rejects it saying it had proposed similar idea even to Congress members during UPA government. When Nitin Gadkari was tasked with preparing India vision 2025 as a part of the BJP’s campaign ahead of 2014 Lok Sabha election, the group met him and presented him the Arthakranti proposal. Gadkari in principle had agreed to accept the proposal if his party came to power. A native of Latur, Bokil completed his engineering and shifted to Aurangabad, the industrial town in Marathwada, for job. While he worked at few places, Bokil initiated a cooperative workers society and dedicated himself to it for the rest of his life. Around eights years ago, Bokil shifted to Pune, from where he brings out a monthly magazine on finance. A Pune based economic think tank, ArthaKranti, which claims to have suggested to Prime Minister Narendra Modi to demonetize Rs 500 and Rs 1,000 currency notes, wants the government to abolish income tax and 56 other taxes and replace it by a Banking Transaction Tax, or BTT, of 2 per cent on earnings. "Imagine, taxes reduced. Petrol at Rs 28 per litre. That is ArthaKranti's next proposal," the outfit tweeted today. ArthaKranti, which literally means financial or economic revolution, is a group of technocrats and chartered accountants and first proposed its five-point proposal for tax reforms in 1999. It had even planned a meeting in Pune on November 11, 12 and 13 to demand that Modi implement its five-point agenda. According to the organization, it has had regular interactions with officials in the Prime Minister's Office all through 2015, and that it had given its blueprint for an economic revolution in the country to Modi in 2014 before he was elected the prime minister. According to the organization, its leading light Anil Bokil, an Aurangabad based chartered accountant and architect, was allocated nine minutes' audience with Modi in July this year, but the two discussed the idea of demonetization for over 90 minutes. The group had also met Modi in Gandhinagar in 2013, when he was the chief minister of Gujarat. On Sunday, the PM said in Belgaum that the demonetization move was planned by a small group of people over the last 10 months. The outfit wants all taxes, including income tax, be done away with. The only current tax which it says should be retained is import duty or customs. Instead, there should be a bank transaction tax, or BTT, to be levied at the rate of two per cent on every deposit. The outfit has applauded the PM for taking the first step, of demonetizing Rs 500 and Rs 1,000 currency notes, and is looking forward to Modi implementing the remaining four steps. The objective of its five-point plan is to reduce the huge cash economy or informal economy that runs outside the banking system. It wants the recently issued Rs 2,000 currency note to be eventually withdrawn as well as other high denomination notes, including Rs 1,000, Rs 500 and Rs 100. It has suggested that all high-value transactions be made via banking instruments. There should be a limit on cash withdrawals. Tax earned from BTT can then be shared between the union government, state governments, civic bodies and panchayats. All other taxes, barring import duty, be then abolished. ArthaKranti believes that the PM has started walking on that road by first launching the Jan Dhan Yojana to give every person a bank account, then working to rollout the Goods and Services Tax (GST) by April 1, 2017 and now demonetization. It also lauds the PM for his intent to have a Uniform Civil Code, that is one law, and simultaneous Lok Sabha and assembly polls, that is one election for the entire country. Way before Prime Minister Narendra Modi demonitised the Rs 500 and Rs 1000 denomination notes, a man had been talking of the need to do the same. When the PM announced the move, invariably, a name-Anil Bokil was thrown into focus because it was this activist who kept impressing on the power corridors the need to demonitise higher denomination notes to curb corruption and counterfeit currency. Founder of Arthakranthi Sansthan, Anil Bokil, according to reports, was allotted only nine minutes to meet Prime Minister Narendra Modi. But, Bokil’s proposal to discontinue higher denomination currency notes and several other proposals interested the PM to the extent that the two entered into serious talks for over two hours. With the PM calling back the higher denomination notes, Arthakranti Prathishtana in association with Yuva Brigade organized 'Arthakrantigagi Vinamra Agraha - Black and White' at Canara High School Urwa on November 13. The program was to create awareness among public about the Arthakranti proposal, bank transactions and various simple ways of exchanging invalid currency under demonetisation. Yuva Brigade convener Chakravarthy Sulibele who delivered a keynote address lauded the move of the Prime Minister and said that while Manohar Parikkar started the surgical strike at the Indo-Pak border, Prime Minister Modi launched a surgical strike on the Pakistan’s fake currency mints. “Modi chased those who were staying at government bungalows in the first step to misuse of public money. The day Modi announced demonetisation scheme, everyone named it as a surgical strike on Indian black money and this surgical strike is sure to be continued,” he said. Appreciating the concern of the Arthakranthi, he said that the first proposal of Arthakranti has brought in huge change and when all the proposals get implemented in the coming days, there will be a strong Indian economy. लोकशाहीची विटंबना करणार्‍या, काळापैसा, दहशतवाद, बनावट चलनाला ङ्गूस लावणार्‍या १००, ५०० आणि १००० या उच्च मूल्यांच्या नोटा व्यवहारातून काढून टाकाव्यात, अशी मागणी अर्थक्रांती प्रतिष्ठान गेली १६ वर्षे करते आहे. सरकारने हा धाडसी निर्णय घेतला आहे. काळ्या पैशांचा राक्षस मारण्यासाठी या ऑपरेशनची गरज होती. ते सरकारने अंशत: केले मात्र आता अर्थक्रांतीच्या इतर चार मुद्यांचा विचार केला तरच सरकार पोस्टमार्टेम वाचवू शकेल, अशी माहिती अर्थक्रांती संस्थानचे प्रमुख सदस्य अनिल बोकील व यमाजी मालकर यांनी देशदूतला दिली. पुण्यातील अर्थक्रांती संस्थानने भारतीय अथृव्यवस्थेला आकार देण्यासाठी प्रस्ताव दिला आहे. सी.ए. आणि इंजिनिअर्सने स्थापन केलेली ही आर्थिक सल्लागार समिती आहे. या संस्थानने दिलेल्या प्रस्तावात पाच मुददे आहेत त्यात शंभर, पाचशे आणि हजाराच्या नोटा चलनातून बाद करण्याची मागणी होती. या शिवाय आयकरासह सर्व ५६ कर रद्द करावेत, सर्व मोठे व्यवहार चेक, डीडी, ऑनलाईन बॅकिंगद्वारेच व्हावेत, रोखीच्या व्यवहारांवर मर्यादा आणून त्यावरील कर रद्द करावा, शासकीय महसूल वसुलीसाठी एक कलमी कर आकारणी पध्दत लागू करावी या मागण्यांचासमावेश होता. अनिल बोकील यांना हा प्रस्ताव मांडण्यासाठी पंतप्रधान नरेंद्र मोदींना नऊ मिनिटांचा वेळ दिला होता मात्र बोकील यांनी प्रस्ताव मांडण्यास सुरुवात केल्यांतर तब्बल दोन तास पंतप्रधानांनी तो समजून घेतला होता. आज पाचशे आणि हजारांच्या नोटा बाद करण्याचा निर्णय झाल्यावर त्याबाबत प्रतिक्रीया देतांना श्री. बोकील व श्री मालकर म्हणाले की, १००, ५०० आणि १००० या उच्च मूल्यांच्या नोटा व्यवहारातून काढून टाकल्याशिवाय भारतीय अर्थव्यवस्थेतील बँकिंग वाढणार नाही, जोपर्यंत बँकिंग वाढणार नाही, तो पर्यंत जनतेला स्वच्छ पैसा म्हणजे भांडवल स्वस्तात मिळणार नाही. ते जो पर्यंत ते मिळत नाही, तोपर्यंत देशातील रोजगार आणि इतर संधी वाढणार नाहीत, हे सूर्यप्रकाशाइतके सत्य आहे. अर्थक्रांती प्रतिष्ठानने भारतीय अर्थव्यवस्था शुद्ध करण्यासाठी पाच कलमांचा एक प्रस्ताव देशासमोर ठेवला असून तो देशाने स्वीकारावा, यासाठी गेली १६ वर्षे प्रयत्न सुरु आहेत. पण भारतात एवढा मोठा बदल होणार नाही, असे म्हणून अनेक जण त्याकडे दुर्लक्ष करत तर अर्थक्षेत्रातले तज्ज्ञ मूग गिळून बसले होते. केवळ जगण्यासाठी घाम गाळणार्‍या आणि रक्त आटविणार्‍या कोट्यवधी भारतीयांचे मोठ्या नोटा रक्त शोषत आहेत, या नोटा जगातल्या कोणत्याही अर्थशास्त्रात बसत नाही, हा मुद्दा आहे. अनेकांना हे जाणून घेतल्यावर धक्का बसेल पण ते खरे आहे. भारतीय चलनाच्या एकूण मुल्याचा विचार करता १००, ५०० आणि १००० रुपयांच्या नोटांच्या रूपातील मूल्य तब्बल ९४ टक्के आहे. (३७ टक्के – १०००, ४५ टक्के – ५०० आणि १२ टक्के १०० च्या नोटा) सर्वाधिक लागणार्‍या ५०, २०, १० रुपयांच्या नोटांचे मूल्य अनुक्रमे २, १ आणि २ टक्के इतके कमी आहे. (संदर्भ- आरबीआय २०१२-१३) जगाशी तुलना केल्यास अमेरिकेचे दरडोई उत्पन्न ५३ हजार डॉलर आहे आणि त्यांची सर्वात मोठी नोट १०० डॉलर म्हणजे त्याचे गुणोत्तर ५३० पट बसते. ब्रिटन आणि जपानमध्येही असेच प्रमाण आहे. भारतात मात्र हे गुणोत्तर केवळ ६० पट आहे. याचा अर्थ या नोटा काळा पैसा बाळगण्यासाठीच वापरल्या जातात. १००० रुपयांची एक खरी नोट छापण्यासाठी केवळ तीन रुपये खर्च येतो आणि खोटी नोट छापण्यासाठीही तेवढाच खर्च येतो. त्यामुळे खोट्या नोटांचा व्यवहारात सुळसुळाट झाला आहे. यातून देशाची अर्थव्यवस्था किती पोखरून निघते आहे, याची कल्पना करवत नाही. दहशतवादाविरुद्ध लढताना सारा देश भावनिकदृष्ट्या एक होतो, पण तो दहशतवाद या मोठ्या नोटांवर पोसला जातो आहे, असे श्री. बोकील व श्री. मालकर यांचे मत आहे.